Whether you've created an AMIMOTO AMI or you are a AMIMOTO Managed Hosting customer you'll need a keyfile to connect to your server. If you're not familiar with how to secure and store your SSH keys here's how. For Managed Hosting customers you'll receive a keyfile to connect to your server. This keyfile can be found and downloaded from your AMIMOTO Dashboard and Server Info panel. If you are an AMIMOTO AMI Self-Hosting customers on AWS, your keyfile would either be downloaded or created during the server launch or stored from a previous launch. Either way, protecting that keyfile is the same process. If you're on a Mac, start by opening Terminal and navigate to where your keyfile is located. In my case it was located in the home directory. This command will elevate our privileges using sudo which allows us to modify the keyfile with the chmod command. The 400 part of that command means that the keyfile will be read only by your account. This is important because it will protect that keyfile from other programs or prying eyes. Sometimes it's helpful to add your keyfile to your ssh-agent because it will allow you to SSH or access servers by SFTP without explicitly declaring which keyfile to use and where it's located. It might not seem like a big difference but when you're moving directories or just want to save time using the ssh-add command can be helpful. Use the command ssh-add to add your keyfile to your ssh-agent. In our case the keyfile name is id_rsa.a123 and it's located in the home directory. On a Mac and in your home directory is a hidden folder named .ssh. This folder contains your personal ssh keys, host files, and more. 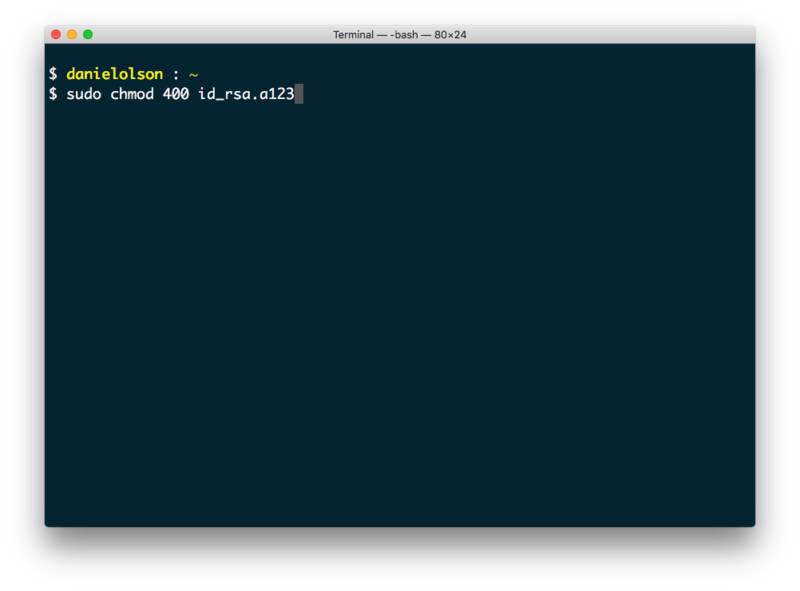 This is an common spot for storing your keyfile and you can move it there with the following command using Terminal. This will use the mv command to move the id_rsa.123 file to your home directory, which is the tilde part and the hidden ssh folder. As you create or launch new AMIMOTO servers it's an easy place to reference and store your protected keyfile.